This image snapped by the NASA/ESA Hubble Space Telescope reveals an exquisitely detailed view of part of the disc of the spiral galaxy NGC 4565, aka the Needle galaxy. This image was released July 13, 2012. 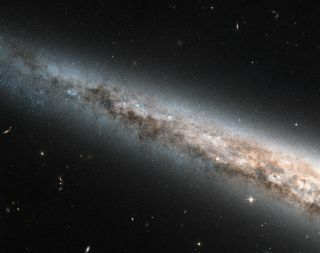 A stunning new photograph by the Hubble Space Telescope has captured the cosmic version of a needle in a haystack: an edge-on spiral galaxy much like our own Milky Way. The new Hubble photo shows one point of the so-called Needle galaxy, a narrow streak of stars located about 40 million light-years from Earth in the constellation Coma Bernices. The galaxy is officially known as NGC 4565 and its spiral shape makes it a tantalizing target for astronomers hoping to compare it to our Milky Way galaxy. According to a NASA image description, "NGC 4565 is relatively close by, and being seen edge-on makes it a particularly useful object for comparative study. As spiral galaxies go, NGC 4565 is a whopper — about a third as big again as the Milky Way." The new view of the Needle galaxy reveals several features that scientists find in the Milky Way. Both galaxies have dark ribbons of interstellar dust blocking some of the light pouring out of their galactic cores. In Hubble's Needle galaxy photo, the dust lanes are clearly visible in the lower right of the image due to the contrast of bright, yellow light emanating from the star-filled interior. The Needle galaxy was first discovered in 1785 by noted 16th-century astronomer Sir William Herschel. Because it is one of the closer examples of a spiral galaxies, Needle has become a popular target for scientists hoping to learn more about our Milky Way galaxy. Astronomers used the Hubble telescope's Advanced Camera for Surveys to create the new view of the Needle galaxy. NASA posted the image to its Hubble telescope website on July 13. A version of the image was entered into NASA's Hubble's Hidden Treasures Image Processing Competition by Hubble fan Josh Barrington. The Hidden Treasures contest challenges astronomy enthusiasts to sift through the Hubble telescope's extensive archive to find spectacular cosmic photos that have never been released to the public. The competition has actually closed, with the results to be released soon, officials with the European Space Agency said. The Hubble Space Telescope launched into orbit in 1990 and has been beaming stunning images of the cosmos to Earth ever since. The mission is overseen by NASA and the European Space Agency. FollowSPACE.com @Spacedotcom. We're also on Facebook and Google+.